Prominent & Leading Manufacturer from Jaipur, we offer tourquise necklaces, rainbow moonstone labrodite beads necklace, rainbow moonstone neon apetite beads necklace, gemstone necklace and mop necklaces. 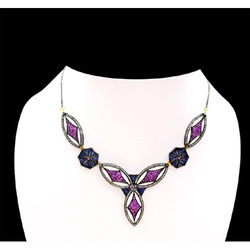 We are highly appreciated in the market for our exquisite collection of Gemstone Necklace. The stones, pearls and other material used in crafting the necklaces are sourced from widely acclaimed vendors of the market. We have been well supported by a team of quality controllers that makes sure to deliver a defect free collection of necklaces. This has enables us in becoming a noted name in the market.